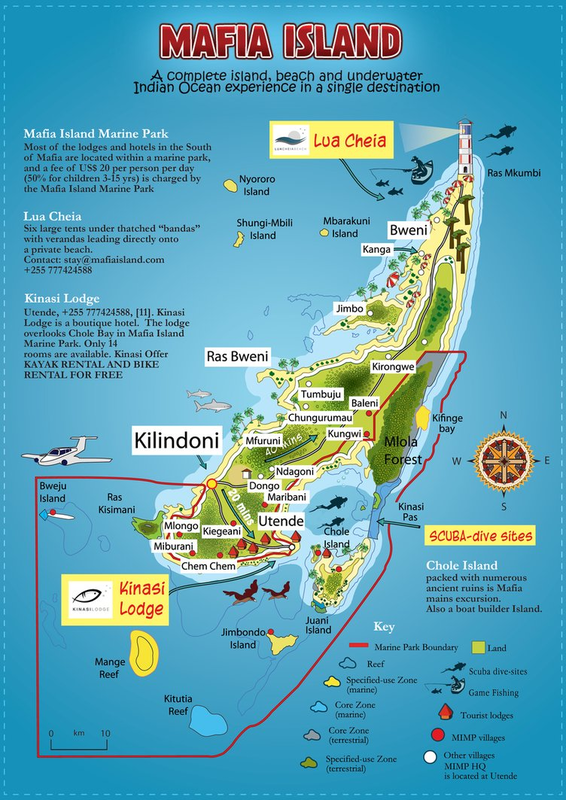 Mafia island lies 30 minutes by plane, 130 kilometres south-west of Dar-es-Salaam. Flights cost $150 each way from Dar, $190 from Zanzibar and $300 from Selous. The resident population of 46,000 are mainly fishermen or smallholder farmers that grow coconut, paw-paw, rice and cassava. The friendly and welcoming islanders create a relaxed atmosphere. The dominant religion is moderate Islam and both christians and muslims live in peace and harmony. The air and sea temperatures remain warm all year round with the main rainy season between April and June. Today Mafia is known as a beautiful Indian Ocean island that is famous for deep sea fishing and scuba diving. Aquatic life is abundant and the coral gardens are in good health due to the protection of the Mafia Island Marine Park. The park is located between the Rufiji River delta to the west and the open Indian Ocean to the east. The dual influences of the river and the sea have combined to create a rich and exceptional biodiversity with unique landscapes under the sea and on dry land. The island has many attractions: snorkelling with the seasonal whale sharks off the east coast of Kilidoni from September to March, and diving on the outer reefs of the west coast, the passes on the edge of Chole Bay, and inside the bay itself. As luck would have it, when the whale sharks aren't visible, this is the best time of year to see turtle hatchings, from April to September, on the beaches of Juani Island, 30 minutes by boat from Chole Bay. The island is also rich in historical sites, ruins, and postcard-perfect sandbanks. Read about the diving here. Read about the tours here. Mafia has a number of lodges and small resorts catering to most budgets. Below is a selection of our favourites. For those wanting a splash of refinement, our lodge of choice is Kinasi Lodge. The lodge has a beautiful pool and beach, thoughtfully appointed and stylish rooms, the food is both plentiful and some of the tastiest around. With only 13 independent, detached suites spread around the large grounds, amidst cashew trees on a hillside which runs down to the beach on Chole Bay, it is easy to relax and feel pampered. 5-night, 4-dive package with 5 nights half board in a standard room, return airstrip transfers, 4 dives and 1 excursion for $691 per person based on two sharing. Marine Park fees of $20 pppn not included. 7-night, 8-dive package, half board in a superior room, return airstrip transfers, 1 excursion for $1061 per person based on two sharing. Marine Park fees of $20 pppn not included. To the north of the island is the remote La Lua Cheia, an ideal spot for those really wanting to get away from it all, of the proverbial beaten track and off the grid. Located at Bweni Village near the northern tip of Mafia is a lovely promontory called Ras Bweni. “Ras” stands for peninsula, and from here one has fine views of the sweeping bay and palm-fringed beaches, superb sunsets over the Rufiji Delta and the moon rising over the Indian Ocean. LA LUA CHEIA is a simple luxury camp located on Ras Bweni. Six large tents under thatched “bandas” with verandahs lead directly onto the magnificent beach; each has an ensuite bathroom built at the back of the tent with solar-heated hot water, so life is very comfortable and private. Solar lights and fans provide lighting and comfort at night. We have kept the site as simple and undisturbed as possible while providing all the necessary comforts. The rooms face north-west and take advantage of the sea breezes during the hot-season as well as the marvelous sunsets over the Rufiji Delta. Food is served always from the barbecue and home-made oven and includes fresh seafood, oysters and mussels harvested by the local people. The wooden floors of the bar and restaurant, the antique and dhow-wood furniture and the soft sand under your tent floors and eating out under the stars on the beach all conspire to give the “barefoot” experience we want our guests to enjoy. ​The stunning feature of the location is the nearly 3 km of beach stretching away in both directions, all yours…..the sand is white and pure and one can always swim, despite tidal changes. With complete isolation from any other tourist facility or commercial activity of any kind, the place is yours. Solitude, nature, complete relaxation from $125 per person per night, full board. Pole Pole is a small, quiet and personal beach lodge that manages an excellent balance between staying in keeping with its surroundings, while creating a feeling of comfort and a relaxed, barefoot style. Five bungalow suites are subtly blended into the surrounding tropical landscape, and private verandas overlook Chole Bay’s infinite palette of blues, with great views of surrounding islands.Twin and double bungalows are furnished with carved and antique pieces. Each unit is self-contained with a spacious and comfortable bathroom.Two family bungalows, with two rooms separated by the bathroom and a small corridor for privacy are also available. Pole Pole also provides massages from its spa overlooking the beach. The food is very good; combining an Italian touch of class with local flavours and ingredients. Fresh fish and seafood daily, homemade pasta and ice cream, Swahili dinners and tropical fruits and vegetables are enjoyed by guests in the intimate atmosphere of the restaurant. Rates start at $260 USD per person per night, including all meals, transfers, and one snorkelling or boat activity each day to one of the attractions of the island (Whale shark snorkelling is not included). . Located on Chole island, a short sail across Chole Bay. As you approach for its mangrove-lined shores, and as the first treehouses come into view, the last vestiges of the 21st century recede: no roads, no cars, no electricity... Just a star-spangled sky, flickering candles, superb food, great company, and the timeless luxuries of space, immersion in nature, privacy, and utter peace. Chole Mjini is a very special lodge in a beautiful location. It is fairly rustic – its long drop toilets certainly wouldn't appeal to everyone, – however for those who love the outdoors and are looking for something completely different, this lodge is hard to beat. Creators and owners Anne and Jean brought their family up here, and although the kids flow left the nest, Anne and Jean are still here full-time, sharing their love and passion for Chole with their guests. It's a wonderful place to stay.